PLS evaluates your loved one’s functional, physical and safety status, identifying risk factors and options that may help improved your loved one’s quality of life. Our written report includes recommendations for resolving each issue. Here’s how it differs from those performed by physicians, hospitals, nursing homes, home care agencies, or assisted living communities. 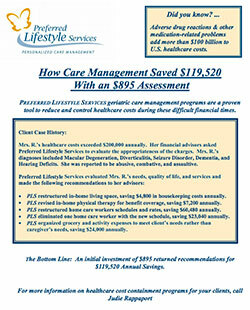 The assessment is a one-to-two hour interview in the client’s residence (private home, Assisted Living Facility, Skilled Nursing Home) where the client is more relaxed and the Nurse Care Manager can observe first-hand the client’s ability to meet her own needs and care for herself in her own environment. The Nurse Care Manager presents her finding to the family in a written report complete with recommendations to resolve problems. The family and Nurse Care Manager consult to agree on the next steps, and the Nurse Care Manager begins to implement the recommendations, monitor, coordinate, supervise, and adjust services to meet the client’s need. As opposed to one or more physicians, often working independently of each other to treat purely clinical problems, the goals of the assessment and recommendations are not limited to treating medical problems—they include to restoring the client to an improved quality of life and helping the client live to his or her maximum level of independence. The Nurse Care Manager’s holistic sphere of influence includes anything and everything that affects the client’s daily life and ability to function to maximum level in his own home. "Preferred Lifestyle Services assisted me with finding the right homecare agency that had kind, compassionate, think-on-their feet caregivers for my mother as well as those that watched over my father as he lay in the hospital prior to us making the decision to bring Hospice care in."